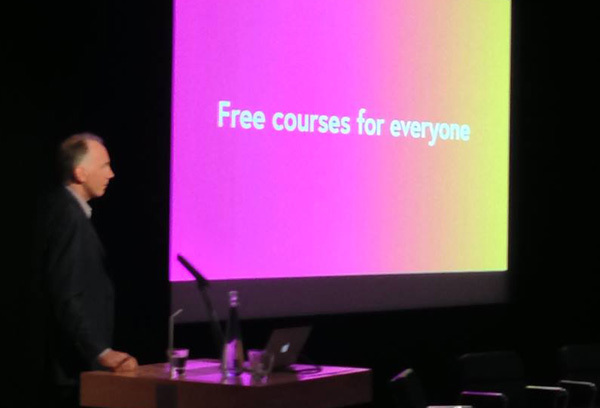 FutureLearn, the online university platform has recently reached one million student sign ups. The website that provides students from all over the world with massive open online courses (known as MOOCs) has seen a sharp rise of 20% more UK students in the final months of last year, despite only launching in September 2013. FutureLearn makes online courses available to students in 190 countries around the globe and partners range from the universities of Strathclyde and Glasgow to The University of Oslo, Norway to the Hanyang University in South Korea. “We’re just at the start,” said chief executive Simon Nelson. Students using the site have carried out over 400,000 hours of study time, the equivalent of 46 years, this month alone. “Scale is one of the most exciting things about this emerging market,” said Mr Nelson. Findings show the average age group of students is between 26 and 35 with 63% being women. The website places great emphasis on ‘social learning’ meaning that FutureLearn students are able to network with one another and ask questions easily. Last month alone, the site saw over 118,000 comments from students conversing with one another. Courses concerning Health, Business and Online & Digital are the most popular among UK learners with ‘Begin Programming’, ‘Introduction to Forensic Science’ and ‘Mental Health and Wellbeing’ as the top three courses. The site has found that women prefer the Health and Business side whilst men sway towards Digital and Online courses. Within these courses are ‘Caring for Vulnerable Children’ run by Graham McPheat and ‘Understanding Modern Business and Organisations’ run by Viktor Dörfler. Both are lecturers at The University of Strathclyde. The site allows its users to learn at a time that is suitable to them allowing those who have other important commitments the same opportunities as your average student. Massive online open courses could be the way forward for people who are keen to get back into education but may not have the skills or funds to enter at university or college level straightaway.